Wanting to eat healthy and nutritious without giving up your favorite foods? 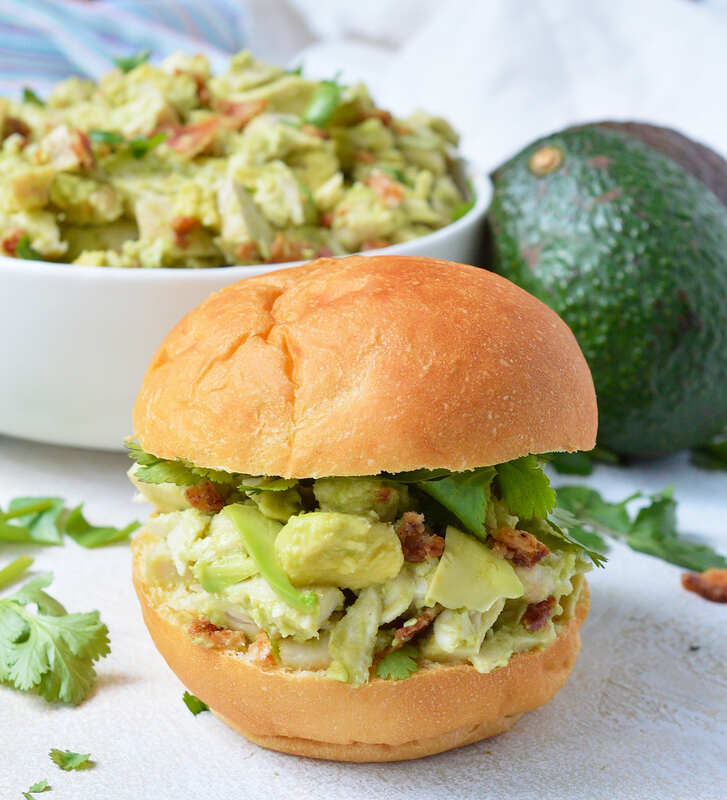 This Bacon Avocado Chicken Salad Recipe is full of flavor, healthy fats, no-mayo and is Whole30 friendly. 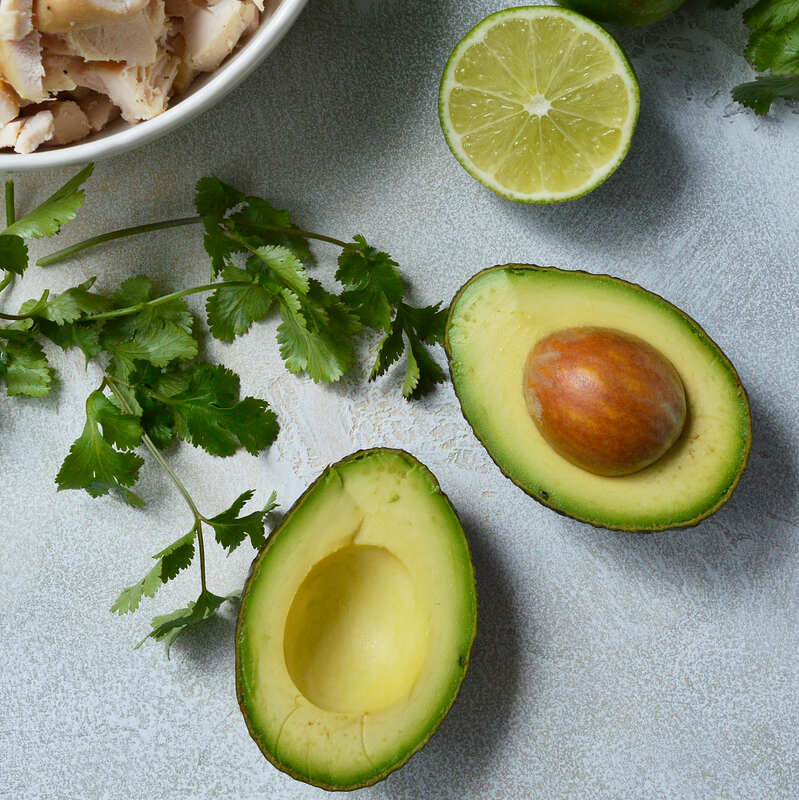 I am proud to be partnering with the Hass Avocado Board and the American Heart Association through Kitchen PLAY to bring you this tasty recipe! As always, all opinions are 100% my own. 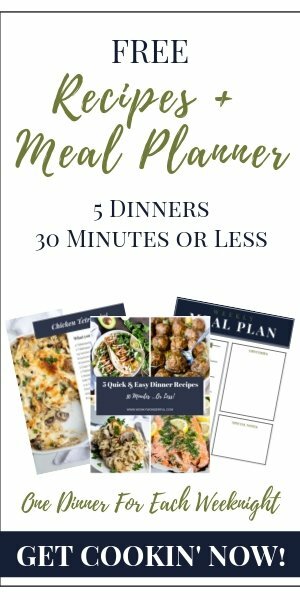 This is one of the recipes that got me through my Whole30 month. I need flavorful, satisfying meals when I am eating healthy otherwise it does not last long. 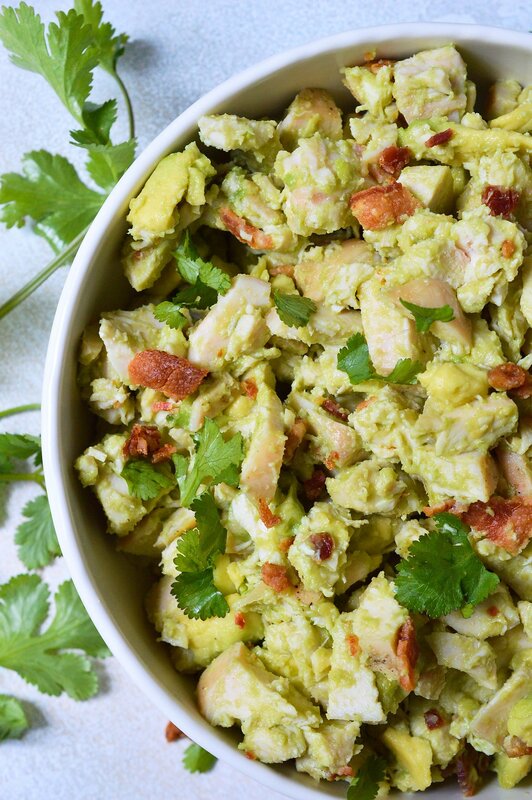 This Bacon Avocado Chicken Salad is packed with protein! For an in depth tutorial on How To Cook Shredded Chicken check out Well Plated. 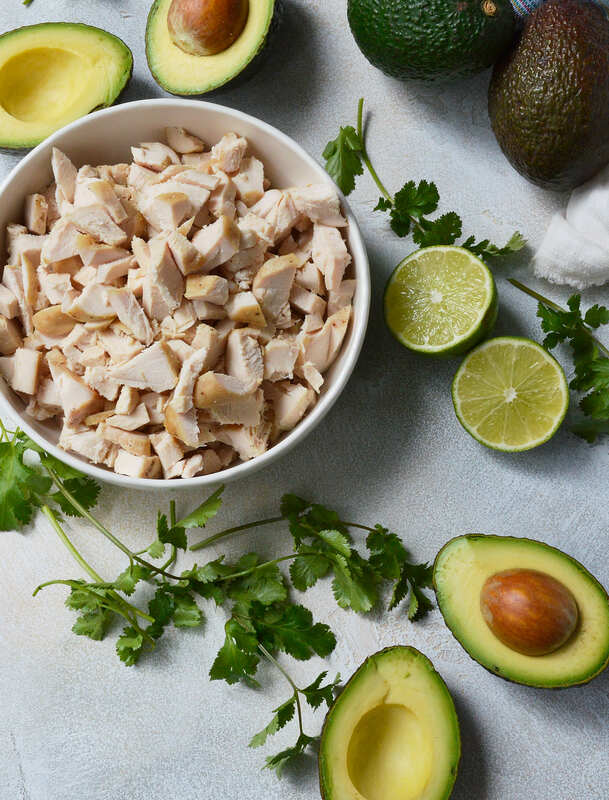 Lean chicken and nutritious Hass Avocados make this meal nutritious and filling. Fresh avocados are a heart-healthy fruit. They provide naturally good fats, are low in saturated fat, and are cholesterol- and sodium-free. Avocados, which are a fruit although most people think of them as a vegetable, contain less than one gram of sugar per 1-ounce, the least amount of sugar per serving of any other fresh fruit. The Hass Avocado Board (HAB) and the American Heart Association (AHA) are encouraging Americans to eat the daily recommended amounts of fruits and vegetables, an endeavor that has the potential to limit deaths from cardiovascular diseases, stroke and diabetes. While following the Whole30 I ate small amounts of this Bacon Avocado Chicken Salad alone to fill me up. It could also be served in lettuce wraps. Or, serve this on top of a nice big salad. If you are adding bacon, just make sure your bacon is Whole30 compliant. I like to add fresh cilantro and finely chopped jalapeño for extra flavor! And of course, if you are not following the Whole30 plan, this chicken salad is terrific on soft bread rolls or tortillas. 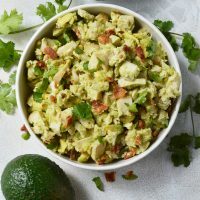 This Bacon Avocado Chicken Salad is still an excellent alternative to the traditional mayo chicken salad. Combine all ingredients until fully mixed. Try to keep some avocado chunks intact. Store in a zip top plastic bag with the air removed to prevent browning. Refrigerate. Serving Suggestion: Serve on sandwich bun, in a tortilla or on a lettuce leaf for Whole30. Top with seeded sliced jalapeños and fresh cilantro. I love that you used avocado in this salad, Nicole! This salad is a dish I was searching for to include in my balanced diet. I enjoy this more than chicken salad made with mayo! I would love to have this in lettuce wraps – or on it’s own. Looks fantastic! I LOVE putting avocados in chicken salad. And with that bacon? SOLD!!! This looks absolutely amazing. So much deliciousness in one recipe. Avocados for the win! This looks awesome! I’m putting it on my list for lunches this week. Thanks! A great lunch, indeed. 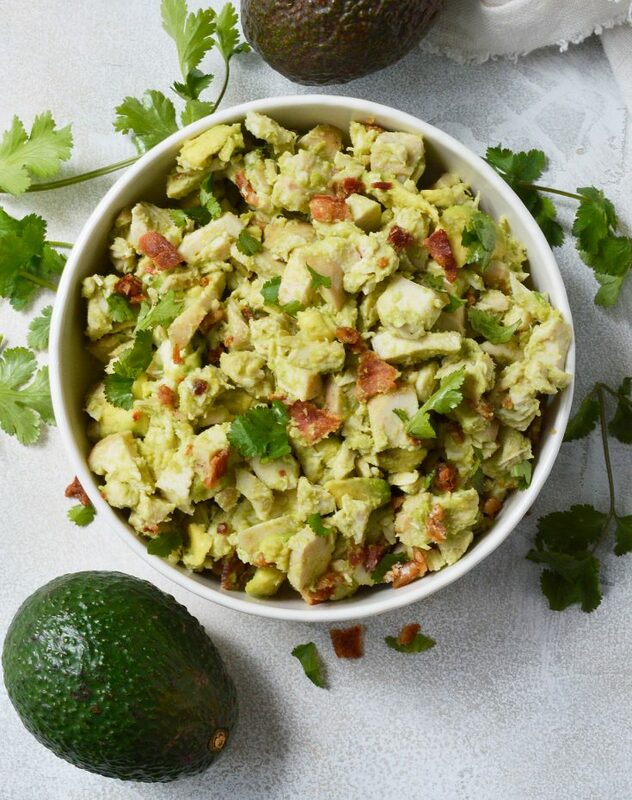 Wow…Bacon Avocado Chicken Salad looks yummy and healthy! Avocado rich in several B vitamins and vitamin K, with good content of vitamin C, vitamin E and potassium. That’s why i prefer avocado:) Thx for sharing recipe! You said you are this in small amounts…how many servings is this recipe? I’m trying to make I think for my family if 4…just didn’t know if it should be doubled? Thanks! Amazing salad recipe. Avocado and Chicken Breast is my favorite. Full of protein, nutrition, and calories. Thanks for sharing! Yes! This is one of my faves! These bacon avocado chicken salad are so Instagrammable and adorable! As you know I made it a short while ago and it was lovely! Thx for sharing!